This is to give you some customer feedback. 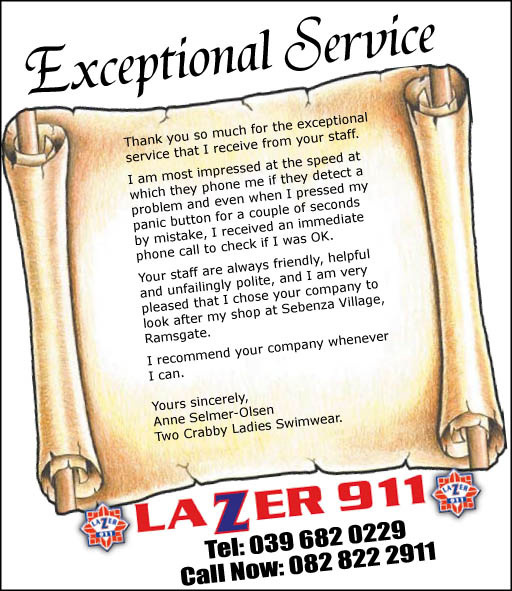 I’ve had absolutely wonderful service from Lazer 911 – from the persons who answer the phone, from yourself and Raldon who ‘installed’ the alarm at 14 Parklands yesterday. Every interaction has been cordial and professional, and the persons have good product knowledge and keep their word – clearly this is a reflection of Lazer’s work ethic. It’s a pleasure doing business with Lazer 911! I would like to commend your armed responds unit as well as your controller that was on duty last night. I was alone with my baby and when I had woken I discovered we had no power. It was pitch black outside and murphy’s law when you alone you hear everything around you. I had called the control room and at around 11.45pm and advised him I was scared out of my wits and asked him to send his guys to patrol the area, I had also asked the control room guy to advise his guys that I am alone and for them to let me know that there were around. Within minutes of my call I heard the guys ring their siren once outside to say they were around and that had given me some peace of mind. Around 2 pm I was still wide awake out of fear of being alone and I noticed some lights shining into my bedroom, I once again called the control room and the lovely gentleman sent out his guys who responded almost immediately…they were probably patrolling the area as I had called so many times. On their second arrival they viewed the full property again and the control room guy assured me all was in order, which was a huge relief for me. I would like to express my sincere gratitude to the responds team and control room guy who really went out of their way to assist me last night. For many people they many feel this is their job but to me to know there are people in your team that really are sincere and care about the neighbourhood is amazing. Please thank them for last night and I do apologise as I do not know their names and who came out last night but I must admit they really put me at ease knowing I could call on them at any time and they would be there to protect me and my family. 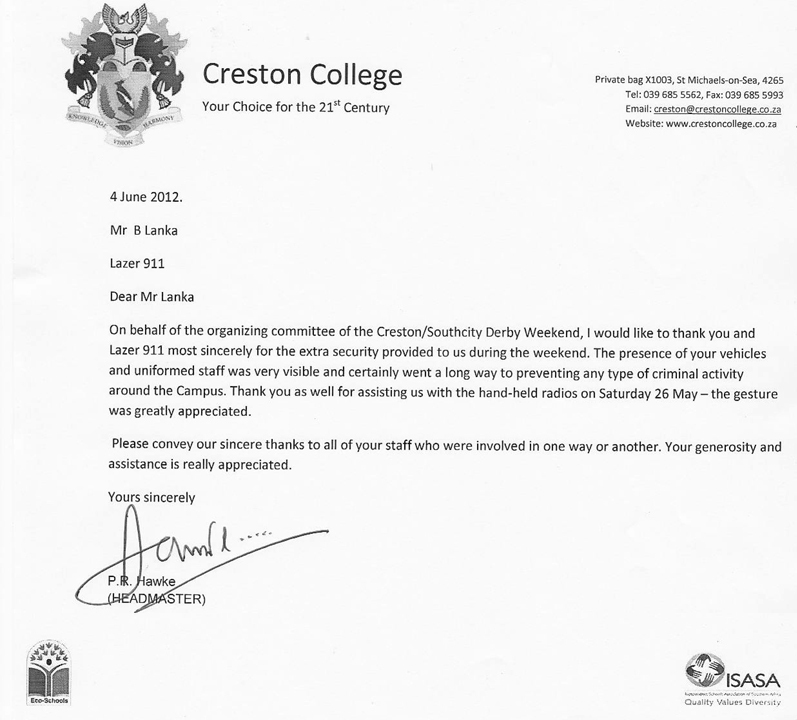 Thank you for the excellent service you and your team provide to the public and personally to myself and family. You have an excellent team of people working for you. On behalf of the Latchmigadu Family of 25 Pine Lane Protea Park, I would like to extend our sincere gratitude to you for the quick response and excellent service we have received yesterday. Your medical team together with the security team have done an outstanding job in our emergency situation. We really appreciate your commitment, dedication and hard work that u put in to making sure that our dad was taken care of and also transported efficiently to hospital. May God Richly Bless you and your families as well as your business as it grows from Strength to Strength each day. I write on behalf of our team leaders Mrs Leila Edwards and Mnr Cabri van Zyl and members of the Tweni Crime Watch. We wish to express our sincere thanks and appreciation to Lazer 911 staff and control room for their quick response to our call for assistance the morning of 22 September at 3.30am.. Your control room official was really very efficient, giving us quick advice , called the SAPS and went further to despatch Lazer reaction officers to the scene. What impressed us was that whilst one reaction officer went to the scene of the crime, two other Lazer vehicles were seen actively combing the escape routes to try and arrest the suspects. In this way your company went the extra mile to help us fight crime in Tweni . 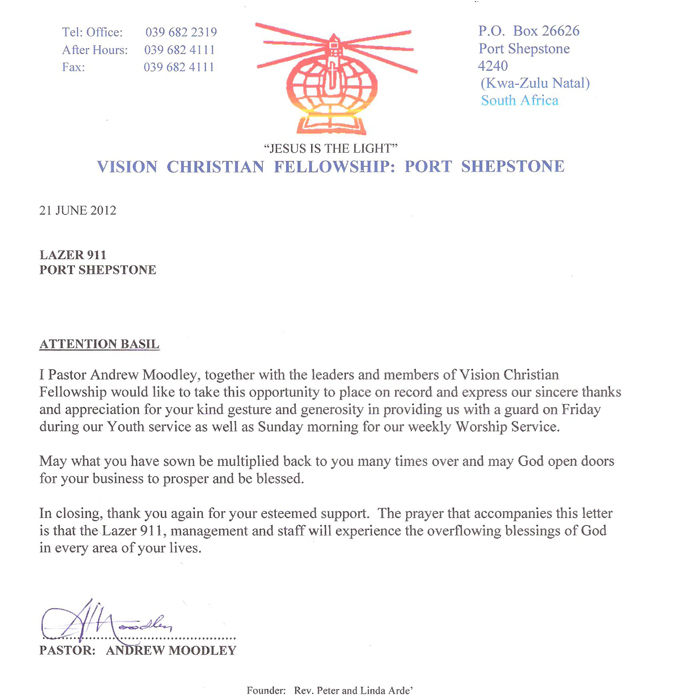 We have also noted that this was not a Lazer 911 client and despite that your response was highly efficient and praiseworthy- for that we can only commend your company for putting the lives of our people first. 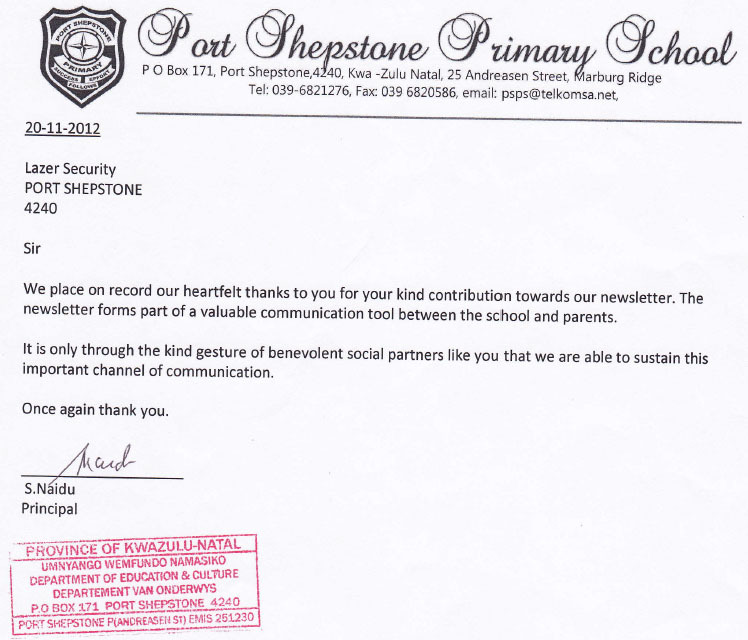 Once again our thanks and appreciation.